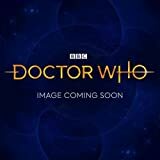 Derek Jacobi returns to the role of the Master for the second set of stories, this time it is four episodes that follow a single storyline, as opposed to the slightly more episodic nature of the first box set. The story takes place on a colony planet called Callous, in which a small group of artists attempted and sort of failed to make a home. Their livelihood depends upon a mine, and the story revolves around this mine, its contents, the people who give everything to make the mine viable, the planetary governor who wants to take everything she can from the inhabitants, and the Master who has his own secret plans and machinations. In short...it is an excellent story. I recommend this box set, there will likely be SPOILERS ahead, so reader beware. The opening episode, Call for the Dead follows Elliot King, the frustrated would-be leader of Callous, whose long attempts to make the mine worthwhile have yielded very few positive results, and the Governor bleeds him dry whenever she gets the chance. He has spent so much time trying to make the mine earn just enough money to keep up with his payments that he has basically lost his family...his wife and daughter moved off-world, and while his wife is very ill, his daughter misses him daily. Meanwhile, he is being stalked by an odd with a ringing telephone, and when he finally answers the call, the Master is on the line. Without getting too deep into it, Elliot decides to take his own life not long after his chat with the Master, and whatever plans the Master has are clearly set into motion. Elliot's daughter Cassie and her wife Martine come to Callous to take over where her father left off. Only Cassie is more adept with the mine than her father ever was. He was an artist trying to make a living digging in a mine, as she went to school specifically to learn how to mine properly. But when she too runs into trouble...another Ood phone call comes her way, only this time the Master offers his help. The set continues with The Glittering Prize, and this time the Master is posing as Mr. Orman, a kindly gentleman helping Cassie to get the mine working. They strike a substance that could make them all rich...but if the Governor finds out they have it, she is sure to come and attempt to skim even more profits off their hard work. The Master offers his help yet again, helping them plot to sneak the substance off the planet and hide it from the governor until they can safely make their money off of it. But the substance has a psychic side effect, as it slowly can drive people mad or hallucinate, and it seems to drive the Ood workers completely out of sorts. The Persistence of Dreams focuses solely on Martine as she tries to keep her sanity guarding the substance. She is accompanied only by an Ood bt finds herself hallucinating about her late mother, Cassie, Mr Orman and more...never knowing what is real and being driven to the brink of sanity by the awful substance. When the Ood seems to go mad as well and attempt to kill her, she launches herself into space, and hopes that hope can reach her in time...but of course, the Master has other plans. The set is closed out by Sins of the Father which sees the Governor arrive on Callous and demand the substance because someone tipped her off that they had found it. She has captured and is torturing the Master daily for answers, but no mere Governor can really get anything out of the Master! Cassie has been cast out by most of the inhabitants of Callous, who blame her of much of their current woes, particularly the homicidal Governor who intends to kill them all for answers. But the Governor didn't count on her prisoner actually being someone of influence. She didn't count on his control of the Ood, or his ability to escape his chains...and the Master's plan finally comes into focus. He just needed the substance. Callous just happened to be his best route of getting the rare stuff, and he has beaten everyone before they even knew he was a threat. The story concludes with the Master meeting a Time Lord to sell off the substance so the Time Lords can build a new weapon against the Daleks. It seemed almost odd to me that the Master would do all this for such a petty thing as money and helping the Time Lord cause. Just seemed off...but then a smaller item was thrown in for his payment. The Chameleon Arch. It nicely tied in with the very item he was using when we first met this Doctor on TV (and actually used at the end of the previous box set, putting this one ahead of that timeline wise), and makes all his efforts in this story seem perfectly worth it for his character. It may have been a mild hassle putting all those pieces into place, but he got what he truly wanted out of it. An eventual escape from the Time War. This is an excellent set, that somehow managed to top the first War Master set. And that was a tall order, as that first set was wonderful. I am already excited for more, as Big Finish have clearly been chomping at the bit for years to tell Time War tales, and they are reveling in it with every chance they get. Whether they focus on the War Doctor, the War Master, or just seeing the seeds of the war in the Eighth Doctor or Gallifrey sets. In all attempts, they have made some exciting stuff. "I’m sure you’re all wondering why I’ve gathered you here. I’m sure you’re all wondering why the village is home to woodland creatures with a taste for tea, cakes and secrets. And I’m sure you’re all wondering where the Doctor has vanished to. The truth is not as quaint as the pretty cottages and mostly cute residents would have you believe. Murder has come to Mistpuddle. And no-one is leaving until we uncover whodunnit." So..... The Mistpuddle Murders is essentially Doctor Who, Beatrix Potter, Enid Blyton, Wind in the Willows and Miss Marple, all popped in a blender, shaken for a bit, and then left to set. And sadly it wasn't my cup of tea. Mistpuddle Murders (as well as featuring the characters Nyssa, Tegan and somewhat briefly the fifth Doctor), also features biologically engineered, human-sized woodland animals, who have dialogue gifted straight from Beatrix Potter. Now I'm not saying that this concept is any weirder than "little green blobs in bonded polycarbite armour"......but, for me......it just wasn't an exciting enough concept to hold my attention. In fact, I have to be honest - if I weren't reviewing the story for this very website, I probably would have bailed ten minutes in. Sarah Sutton is on narration duties and also voicing Nyssa, she does so very well - taking the source material in her stride. She also does a very passable impression of Tegan, but sadly it wasn't enough to raise the story (for me anyway) above mediocre. The writer, Simon A Forward's previous story for Short Trips was Mel-Evolent, which I also struggled with. At the time I thought it was because the story featured my least favourite companion (Mel), but perhaps I just don't get on with Mr Forward's style of storytelling. The Mistpuddle Murders is available HERE to download from Big Finish for £2.99.